A wide range of pewter items were found aboard the Henrietta Marie. Durable and versatile, pewter was widely used in England and her colonies from the 16th through the 18th centuries among the lower and middle classes. Master pewterers, who would have been raised in the craft since they were teenagers, were assigned their own “touchmarks,” similar to a hallmark on fine silver. These marks provide information as to whose pewter was in the cargo. The Henrietta Marie’s lading records mention that the established Africa merchant, Robert Wilson,invested a variety of goods in the voyage, probably including small amounts of pewter from different makers, such as Joseph Hodges and John Emes, both of whose marks were found on the pewter cargo. However, thirty-year-old master pewterer,Thomas Winchcombe, is mentioned in his own right.New to the slave trade, he would have been welcomed by the other investors because of the high demand for pewter in Africa. Further, they all knew that any items not used for barter in West Africa could be expected to be purchased by colonists in the Caribbean. 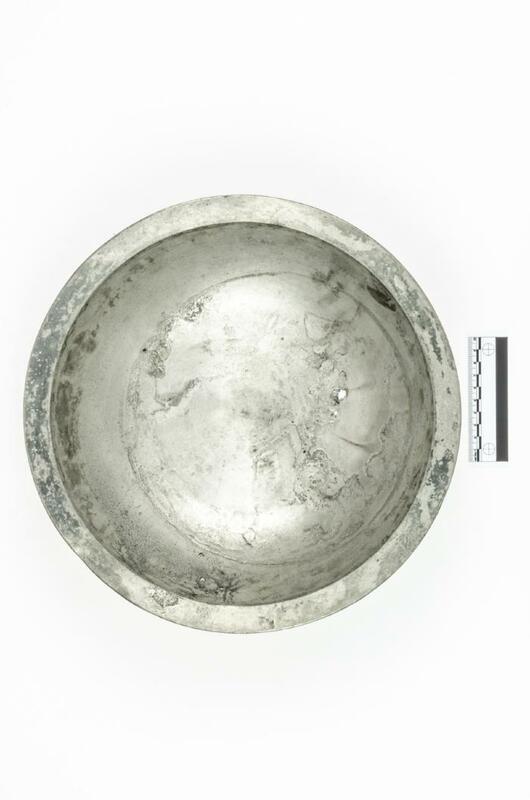 Winchcombe consigned six hundred weight (about six hundred and seventy-two pounds) of pewter in the form of bowls, basins, tankards, bottles, and plates. A few of these were marked “HM,” designating them for use by the crew but the majority, particularly the basins, were unmarked and packed in straw, ready for trade in Africa. Two sizes of basins were found on the wreck site, one weighing three pounds and the other, four pounds. Walter Prideaux, of the merchant slaver Daniel and Henry which sailed in 1700, found that a four-pound basin was worth nine-tenths of an iron bar (the currency standard) and a three-pound basin, two-thirds of a bar. James Barbot, sailing aboard the Albion Frigate in 1699 found that thirteen or fourteen basins would buy a man, and tenor eleven, a woman. Of the three-pounders, it would take nineteen or twenty to buy a man and thirteen or fourteen for a woman.